We’d love your help. Let us know what’s wrong with this preview of Summer in Snow Valley by Cindy Roland Anderson. Rebecca Dash loved spending her teen summers swooning over Jane Austen and helping her aunt at the Starry Skies Bed & Breakfast in Snow Valley. But as a recent college grad, she'd rather write sappy romance novels than go out with guys that make her a nervous wreck. When a team of fire-fighters set up camp on the lawns of the B&B and Captain Wade catches her eye, Becca soon learns that there's more to a happily-ever-after than a flirty firemen with muscles the size of the Montana hills. Mercedes O'Shay has sworn off gorgeous men because they have a tendency to break her heart. When she meets her new neighbor, Chet Bauer, she immediately puts him in the Do Not Date category based on his well-defined muscles and stunning blue eyes. To ask other readers questions about Summer in Snow Valley, please sign up. I really enjoyed the Snow Valley Christmas anthology and was looking forward to this summer collection. Snow Valley, MT is my kind of town. I love the small town feel, where everyone knows everyone. This was a fun collection of stories, I've been super swamped the past week or so and it's nice to be able to grab a quick story when I can squeeze it in. That's why I love anthologies so much. My favorites stories of the collection were, Catching Caytie, First Love and A Touch of Love. They're all c I really enjoyed the Snow Valley Christmas anthology and was looking forward to this summer collection. Snow Valley, MT is my kind of town. I love the small town feel, where everyone knows everyone. This was a fun collection of stories, I've been super swamped the past week or so and it's nice to be able to grab a quick story when I can squeeze it in. That's why I love anthologies so much. My favorites stories of the collection were, Catching Caytie, First Love and A Touch of Love. They're all cute reads though. I grew up in a small town and have such fond memories of the lazy days of summer. Most everyone knew each other and the town pulled together for our Town Days, celebrated at the end of July. This compilation really brought back those memories for me and I'm now longing for those simpler times. In fact, I really want to find a place such as this to finish raising my family in. I loved Christmas in Snow Valley and this book solidified my love for this fictional town. I really enjoyed seeing snippet I grew up in a small town and have such fond memories of the lazy days of summer. Most everyone knew each other and the town pulled together for our Town Days, celebrated at the end of July. This compilation really brought back those memories for me and I'm now longing for those simpler times. In fact, I really want to find a place such as this to finish raising my family in. I loved Christmas in Snow Valley and this book solidified my love for this fictional town. I really enjoyed seeing snippets of the lives of the characters from the previous book (Christmas), but I really loved getting to know new characters. Each story brought a piece of the town and its inhabitants to life and it's so hard for me to choose a favorite. I loved each one for different reasons. The feelings of belonging, hope for the future, forging new ties and cementing old ties, hard work, and family are common themes running through each of these stories. I really hope there is more about this place and these people on the horizon! Content: mild romance and one or two had mild religious elements. Clean! I LOVE THIS SERIES! Summer in Snow Valley is just as WONDERFUL as Christmas in Snow Valley! Maybe even a little better! Six authors - Six stories - Hours of FANTASTIC reading! Each story is DELIGHTFUL! I recommend ALL of them! Could not pick a favorite! Run away with Caytie as she escapes the grasp of her father and a wanna-be fiance as she finds refuge at her uncle ranch. I LOVE THIS SERIES! Summer in Snow Valley is just as WONDERFUL as Christmas in Snow Valley! Maybe even a little better! Run away with Caytie as she escapes the grasp of her father and a wanna-be fiance as she finds refuge at her uncle ranch. Walk down the runway with Annalisa and learn that being a beauty queen is no easy task and takes a lot! But Cameron is there with her every step of the way...and big brother will do almost anything to protect her. Read how Luke opens up Annie's heart and gives her the freedom to be herself...and find love with a good man. You will laugh, cry, sigh, giggle and clap as you watch Janet fall head-over-heels ONCE AGAIN with Michael. Budding romance novelist, Becca, will capture your attention as she finds love for herself during a summer full of cowboys and firemen...oh yeah! And this set wraps up with Mercedes who came to Snow Valley with her sister to leave the clutches of the many men who tend to break her heart-- She is not prepared to meet Chet--Can she trust this man? It's a tug-of-war between head and heart--which emotion will win? I really enjoyed the first collection by these authors- Christmas in Snow Valley. I was so happy to hear they had joined together again to give me more clean romances in a setting I feel like I now know. Snow Valley! As you can see from the blurb above, this book features six different authors each with a novella length story. Two of my all time favorites are featured in this book- Cindy Anderson and Cami Checketts and I loved both of their stories here. All the stories were good though and I sur I really enjoyed the first collection by these authors- Christmas in Snow Valley. I was so happy to hear they had joined together again to give me more clean romances in a setting I feel like I now know. Snow Valley! As you can see from the blurb above, this book features six different authors each with a novella length story. Two of my all time favorites are featured in this book- Cindy Anderson and Cami Checketts and I loved both of their stories here. All the stories were good though and I sure did enjoy my time spent with this book. I started out reading these straight through but about mid-way I was diverted and had to catch the rest of the book in snatches. That's the good thing about anthology collections, the stories are short enough that you can read one at a time, here and there, or you can read them all straight through. There is a continuity with the setting so you feel like you are getting to know the whole town and visiting some familiar places within each book. I really liked that. I'm not going to review each book in this anthology individually. Instead I will give a general review for all of them combined. Each and every story is well written and fun to read. I enjoyed ALL of them! The stories are set in a common town in Montana, Snow Valley. There is some crossover with characters from different perspectives. It was fun to find a character from a previous story and integrated them into the same time and setting. Every story is clean. They all have great character and plot I'm not going to review each book in this anthology individually. Instead I will give a general review for all of them combined. Every story is clean. They all have great character and plot development. This is an anthology that is perfect for summer. This is the second book in a series of anthologies. I read this book without reading the first and didn't feel lost or that I was missing something. I do think that some of the happy couples that were background characters had their story told in Christmas in Snow Valley. Six authors, six romances, all in the wonderful world of Snow Valley, Montana. (There's a Christmas in Snow Valley, too!) You'll love these clean, heartwarming, funny stories. Between 100-150 pages each. I received an eARC of this anthology from the authors in exchange for an honest review. This does not affect my opinion of the book or the content of this review. First Love: Love First by Taylor Hart is the fourth novella in the Summer in Snow Valley Romance Anthology and focuses on a character that was introduced in the Christmas anthology. Janet Snow has beaten all odds, she's survived term I received an eARC of this anthology from the authors in exchange for an honest review. This does not affect my opinion of the book or the content of this review. First Love: Love First by Taylor Hart is the fourth novella in the Summer in Snow Valley Romance Anthology and focuses on a character that was introduced in the Christmas anthology. Janet Snow has beaten all odds, she's survived terminal cancer, and now she's raising her daughter alone in Snow Valley. Then at her brother's wedding, who should appear but the man she's never stopped loving...Michael Hamilton. Can they find their way back to love? Michael Hamilton.....let's all take a moment to swoon. Michael was Janet's high school sweetheart and first love. We all remember those, right? Well, for Janet Michael wasn't just a first love, he was her only love. Though she did marry, I don't think she ever loved the guy like she did Michael. He's handsome, single, never forgot Janet, and he's in town for Kevin's wedding which causes a whole heck of a lot of trouble. One of the things I love about not just this novella but the whole anthology is that it is clean romance! You don't get that a lot in the adult world and when you do it's usually really corny. However, this author and the rest do a great job of conveying the romance, infusing it with Christian values and all the while still making it swoon-worthy. The sweet relationship between Michael and Janet left me rooting for them and my heart aching for them all at the same time. Michael knows what he wants and he's willing to give up anything to get it. Janet knows she loves Michael but in her mind she can't. The story focuses on what a lot of recovered cancer patients feel like: fear of the cancer returning and what it does to those she loves. She wants to save Michael from that, but also she's a bit scared for herself. She's been married and left before. She now has a daughter to think of. The story looks at Janet and if she's willing to risk her heart again. I loved the way that Jace and Caytie started off their relationship with a couple of frustrating run-ins with each other before finding out they were staying in the same home. That made for some great interpersonal tension. I don’t blame Caytie from running away from her father and her boyfriend at all. I would have done the same thing. It’s obvious that marriage doesn’t mean much to her father or her boyfriend. I liked the compassion that Caytie had for Kellen and how she tried to help him see t I loved the way that Jace and Caytie started off their relationship with a couple of frustrating run-ins with each other before finding out they were staying in the same home. That made for some great interpersonal tension. I liked the compassion that Caytie had for Kellen and how she tried to help him see that he was just as valuable now as he was before his accident. I thought her personality appeared realistic. I found Jace to be quite amusing and wanted to laugh with him at some of the things that made him laugh about Caytie. I did think he should have spoken up to Victoria though instead of letting her keep hoping that maybe there still might be some hope for a relationship. One flaw I found in the book was when Caytie disappeared saying she went back to California was that her car was actually still at the ranch. Why didn’t anyone notice that? It should have been a big clue that something was wrong. There were quite a number of interesting twists and turns in this story that kept it fresh and interesting with a touch of suspense and danger. I was surprised by the actions of one of the characters that brought the danger to Caytie. I would never have pegged this person to do something like that given how thoughtful and kind this person was throughout the rest of the book. I enjoyed this clean contemporary romance quite a bit and would recommend it to anyone who likes romance stories. This novel complements the other Snow Valley novels in that some of the characters from the other stories appear from time to time. I gave Catching Caytie 4 atars out of 5. Thank you to the publishers for providing a copy of the book in exchange for a fair and honest review. A positive opinion was not required. All thoughts are my own. This anthology is the follow-up to the wonderful Christmas in Snow Valley as we return to Snow Valley, Montana. I really loved the first antho and was excited to see the authors return with new stories featuring some very yummy cowboys. I'm still reading it as of this review but I'm definitely enjoying the stories and am currently on Cami Checkett's (a fave of mine) A Touch of Love after reading Catching Caytie. When I started, I had planned to read a little of Cindy Roland Anderson's Catching Ca This anthology is the follow-up to the wonderful Christmas in Snow Valley as we return to Snow Valley, Montana. I really loved the first antho and was excited to see the authors return with new stories featuring some very yummy cowboys. I'm still reading it as of this review but I'm definitely enjoying the stories and am currently on Cami Checkett's (a fave of mine) A Touch of Love after reading Catching Caytie. When I started, I had planned to read a little of Cindy Roland Anderson's Catching Caytie before bed, but the story caught my attention and never let go until the very end. Caytie was likable and sweet but I couldn't help siding with Jake during their first encounter. Although he was a bit of a grump, I still couldn't help rooting for them to get together and find solace from their broken families and pasts. I also love that although there were clear villains with believable motivations, one of the characters I didn't like (because she was moving in on the hero) was still sympathetic because of the lengths she would go through for love of her son. Later on when she practically dimed out the heroine from the very people she was hiding from, she showed remorse and made things right. Ms. Anderson is definitely on my to-read list as her writing and storytelling moved this story right up to my fave reads. Last year, I Read Christmas in Snow Valley and absolutely LOVED it! I personally wanted more and was excited when I heard that these same authors got together and gave us more amazing stories! I'm going to review these as a whole rather than individually. Snow Valley, Montana is a small town that knows how to celebrate, whether it's Christmas or summer! Pastor John or his nephew James, also a pastor, are involved in a small way in each story. The characters are interwoven into other stories more Last year, I Read Christmas in Snow Valley and absolutely LOVED it! I personally wanted more and was excited when I heard that these same authors got together and gave us more amazing stories! I'm going to review these as a whole rather than individually. Snow Valley, Montana is a small town that knows how to celebrate, whether it's Christmas or summer! Pastor John or his nephew James, also a pastor, are involved in a small way in each story. The characters are interwoven into other stories more in this collection than in the Christmas one. We also get updates on the couples from the first book and they're in all different stages--married, engaged and still dating. I loved getting to know the new characters and their stories. With six different authors and six totally different stories, it's amazing how they seamlessly weave the small town elements and activities together. I felt like I was at the same event in several stories and was just given a different perspective. I don't have a favorite story because I enjoyed them all for different reasons. I loved the humor and romance found in each story. What I love the most about these is how clean they are and that I can recommend this collection to everyone! This is the perfect beach/vacation read this summer. I'm hoping Snow Valley will be around for a long time!! I received a copy of this book to review (I also purchased my own copy). My opinion is 100% my own. Revel in a collection of quality fiction with enough variety and style to suit any taste. Each piece is well written, carefully plotted and aimed at satisfying the market it is designed for. Generally with collections like these, I hate to choose a favorite, but one story truly stood out for me, Tin Foil Tiarars, by Jeanette Lewis , and I can only recommend it as a fun, professional written, well developed tale that cannot fail to satisfy. Tin Foil Tiaras, pivots around a dysfunctional family in Revel in a collection of quality fiction with enough variety and style to suit any taste. Each piece is well written, carefully plotted and aimed at satisfying the market it is designed for. Tin Foil Tiaras, pivots around a dysfunctional family in which both the mother and daughter are beauty-pagent-winner material. A professional beauty pageant coach is hired to get the daughter the title. The plot develops the coach's story--she is a mixture of whimsy and ambition with a huge heart, who has to fight the odds, in the form of a brother 'dead set against his sister entering or winning any beauty contest'. The love interest is played out between the arrogant but hunky brother and the coach. All the characters are well rounded, very believable and the story is a riot of hilarious situations and settings that will have the reader laughing out loud, all the while glowing inwardly at the lovely romantic tale at the root of the fiction. This collection is ideal July holiday reading material so earmark it now, an savor it over the holidays. This was another great anthology set in Snow Valley, Montana. A few characters from the first anthology made guest appearances in this series which I thought was kinda fun! Catching Caytie was by far my favorite... Catherine ("Caytie") Holbrook has lived a pampered, sheltered life, but when she overhears her father and "almost-fiance" Edward plotting to force her hand into marrying Edward, she knows she needs to run. There is only one place she can think to go and she really hopes she will be wel This was another great anthology set in Snow Valley, Montana. A few characters from the first anthology made guest appearances in this series which I thought was kinda fun! This group of stories was just SO FUN!! I don't have a favorite, but I enjoyed my time in Snow Valley. All 6 authors brought something different to the table. I had only read Anderson before this set and now I have 5 new authors I would like to read more by. The small town feel of Snow Valley had me wishing I could live there. The characters were all likeable and I wanted to be their friend. Summer in Snow Valley is a great, relaxing escape from reality. *I was given a copy of this set in exchan This group of stories was just SO FUN!! I don't have a favorite, but I enjoyed my time in Snow Valley. All 6 authors brought something different to the table. I had only read Anderson before this set and now I have 5 new authors I would like to read more by. The small town feel of Snow Valley had me wishing I could live there. The characters were all likeable and I wanted to be their friend. Summer in Snow Valley is a great, relaxing escape from reality. Ready for summer? Need a good romance to read by the pool, on the beach or in your backyard? How about SIX sweet romance stories? That's what you get with Summer in Snow Valley. Enjoy reading this anthology. I'm going to review each story briefly and then touch on the collection as a whole at the end. This one has the best meet cute (is that what it's called?) out of all of them. You know, the moment our two future love birds meet? She runs a red light and almost takes out Jace's truck! Along the way to liking each other, Caytie also helps Kellen. If they do another Snow Valley set, I want his story! I give this one a solid 4. Tin Foil Tiaras b I'm going to review each story briefly and then touch on the collection as a whole at the end. Sweet insecure Cameron! Pageant queen wanna-be who things she's not thin enough, pretty enough, talented enough. Instead she's going to do everything she can to push Annalisa to the crown. Or is she? Kyle is very distracting, and when he finally gives his reasons for not wanting his sister to win Cameron knows she has to look at things differently. I loved this story for this real look at how pushy moms can miss what's the most important. I give this one a 4.5. This one was my favorite. And not because I know Cami and not the other authors. What I loved about this story was the fact Annie isn't your run of the mill romance heroine. She's so real it hurts! Of all the romance novels I've read, only one other woman wasn't perfect (she was in a wheelchair). None of us are perfect, and even though we read to escape, it was really refreshing to met Annie. To struggle with her as she tried to express herself. To fall in love with Luke right beside her because of his patience. Annie's insecurity and attempts to give up what she needs for someone she thinks needs it more is heart-wrenching and warming at the same time. I give this one a 4.5! Ah. This might be my other favorite. I'm a sucker for second chances and this one really packs a punch. If you've read Christmas in Snow Valley, you know that Janet was battling cancer in that set. She's got a new lease on life, but she knows how tenuous it can be. Can she risk handing her heart back to the boy she's always loved when he walked away so long ago? Especially when she still feels broken? Ha! This one was confusing at first. So many firefighters! Who could be the real love interest? This is a bit of a spoiler (sorry!) but I love that history wins out in the end. ;) When it's right, it's right. Becca just has to give it a chance and let some of her preconceived notions go. This one is fun. I give it a solid 4. This story made me smile all the way through. One of my favorite scenes is when Chet's sister tells him not to talk about all the boring trivia he knows. She has no idea that Mercedes loves that! Chet is just sweet in all the ways he tries to avoid Mercedes. Here's two people immediately drawn to each other like magnets, but Mercedes is afraid he'll be like all the others, and Chet is too humble to even chase her. I give this one a solid 4 for the steamy cowboy who brings art back to Mercedes life. As a collection, I have to say I love Snow Valley! It was easy to fall right in since I read the Christmas set three or four times. When the characters from those stories drifted "across the screen" I felt like I was seeing old friends while making these new ones. I give the whole set a solid 5 to show my support for well-written, CLEAN romance! It's got steam without things I feel best left behind closed doors. Plus, I'm a sucker for sweet stories that tug on the heartstrings and make me smile like I'm experiencing that first love sensation. Bestselling Amazon Authors of Christmas in Snow Valley, have teamed up again with six wonderful summer novellas that are sure to make your summer sweet and sassy! Summer in Snow Valley is a collection of six romance novellas. The first one Catching Caytie is a sweet western romance. You have big city girl Caytie/Catherine escaping her father and fiancé and running to her uncle George's house/ranch. There she meets a cowboy and she starts Bestselling Amazon Authors of Christmas in Snow Valley, have teamed up again with six wonderful summer novellas that are sure to make your summer sweet and sassy! Summer in Snow Valley is a collection of six romance novellas. The first one Catching Caytie is a sweet western romance. You have big city girl Caytie/Catherine escaping her father and fiancé and running to her uncle George's house/ranch. There she meets a cowboy and she starts realizing how shallow her live had been before. I like how the author actually took her occupation and made it work and didn't make it seem like a dream. One of the secondary characters, Kelken was very interesting and I am hoping gets his own story . The second book in the story is Tin Foil Tiaras is about a girl who's occupation is to prepare women for beauty pageant. I wasn't sure how much I would like with this one but the author did really good with the story. This one had a touch of more serious issues but they didn't get into the details of the issue. This could have been a very good full-length novel by addressing some of those more serious issues in more detail. The next book was A Touch of Love by Cami Checketts. Where the main character is a massage therapist which I found very interesting how she was able to give massages to the guy she was interested in. I also thought he was very charming how he was trying to go back and find reasons to see her. This one also had a touch of some serious issues with his ex-girlfriend. I like how they resolved it all in the end. His family is full of great characters and I can see them having their own stories in the future. I loved how he handled her mother. The next story is First Love and is a little heartbreaking for me because I hate how one choice can change someone's life and you can't make up for that time that you lost. It's a cute story of getting back together after all those years. It just makes me sad that they missed those years in between. And this one dimming female character also has some issues that she's dealt with. I loved it when she asked him what would you do if I said I had a cough. I liked her least of all the female leads in the series. Although she had a very good story and others might enjoy it. I'm not a fan of love triangles however Romancing Rebecca was a cute book and I really like the ending. You also enjoy how it intertwined a couple other stories in the series. You'll see the bachelor auction and the beauty pageant from another angle. Rebecca has to choose between Nick who she's known from all her summers in Snow Valley when she stayed with her aunt and Wayne the fireman who has been hanging out at the bed-and-breakfast. There is a very cute relationship between Rebecca and her aunt. Mercedes has sworn off hot men because they have a tendency to break her heart. When she meets her new neighbor, Chet, she immediately puts him in that category based on his physique and stunning blue eyes. But the more Mercedes learns about the cowboy who reads classics and forges iron, the more she realizes the heart doesn't see in black and white; it sees light and shadows. This collection of stories are set in the town of Snow Valley, Montana with different characters taking the stage in each one. A few side characters and events bounce around from one story to the next for continuity. I had fun reading each of these clean romances; none of them disappointed me. Very cute Cowboy vs Rodeo Drive Princess romance. Caytie flees her controlling father in California when he tries to force her to marry her cheating boyfriend. She runs to her long lost uncle in Montana to hide out on his ranch until she turns 25 and can legally get her Grandma’s inheritance. This story roped me in like a rodeo calf and hogtied me to the couch until I finished it. Great character development. I loved the ranch setting and the funny things that happened to Caytie while she hung out there. Beauty pageants, Rocky road ice cream, beautiful nature hikes and deodorant work their way into this unique love story between Cameron and Kyle. This was light-hearted, but still wove in serious matters about self-esteem, self-mutilation and what really matters in life. Beautifully told. Adorable story with a hot cowboy and a stuttering heroine who is painfully self-conscious and wonders how he can like her. I loved the romantic tension in this one and how connected I felt to the characters. I liked how love didn’t make problems disappear, but it made them not seem as significant. There were some sweet surprises with other side characters too that I enjoyed. Hero visits his father for a wedding and runs into his old high school flame that he’s never gotten out of his mind these last ten years. She’s divorced and regaining strength and health after beating cancer, while battling her nasty ex and feelings she thought she had put behind her. This second chance at love story will tug at your heartstrings. Young, naïve heroine wishes for love, but doesn’t recognize it when it stares her straight in the face. Instead, she chases the idea of love in a few embarrassing and uncomfortable situations with other hunky men that catch her eye. Two sisters—an artist and a writer—move from Boston to Snow Valley for a year to live in their grandfather’s house. Mercedes has sworn off men after she caught her last boyfriend cheating, but on the day she moves in, she runs into her cowboy neighbor and sparks fly…but she is determined to just look. No relationships for a while. But that might be a hard decision to live by, especially when she discovers that her neighbor isn’t just a handsome face like all the other guys she’s known. I loved the ending chapters. Catching Caytie has humor, likeable characters, fun romance and a clean read. I wanted to get to know the characters more. Caytie Holbrook at 24 has runaway from home. I don't blame her. She has left the high life in Ca and come to her forgotten Uncle at his ranch in Montana. She hopes he will let her stay for two months. Caytie finds love welcoming her. Was cute but dealed with a few serious problems amid a small town beauty pageant. Cameron Elliott has flown in too coach one of the contestants for Snow Valley pageant. Cameron gets a rocky start. Kyle does not want his sister to win the pageant. He watches and makes light of the job Cameron does. Kyle is a good brother. Annie Stirland has moved to Snow Valley Montana to open her own business. Annie does not like to speak to people. She has been put down a lot in her life. Luke Wilson comes into Annie's business to buy his sister a good birthday gift and is intrigued by Annie. Luke is ranching and working for Boeing too. Shares the ranchers point of view with the wolves and ranching. Janet Snow has recovered from cancer and now owns her own flower shop. Her first wedding is her brother's. Her first boyfriend has come back to Snow Valley. Michael Hamilton has come to spend one day with his father. He has not seen Janet for 10 years. They connect right off again. They live totally different lives now.. He has to learn to forgive his father and open his heart again. I love the ending. It was really good. Rebecca wants to write romances but she has never been kissed. She comes every summer to work for her Aunts bed and breakfast in Snow Valley. Mercedes O’Shay comes from Boston to Snow Valley. They plan to fix up there old house. She has given up on good looking guys. She also wants to paint more and save up for a show. There is a rancher next door that they meet as soon as they pull into there driveway. The only problem with these stories is that they are too short. But that is also on the plus side if you don't have a lot of time these can be read one at a time. We see some miner characters from the first set of Snow Valley books, back. But they totally can stand alone from them. They are all clean reads. I loved this novella! I loved how the main characters met and that they ended up spending so much time together when it happens they are going to be living under the same roof. Their story was so sweet and even when they were forced apart they found their way back to each other. It was a great feel good romance much like the first book! I can't relate much to the beauty pageant scene because I never did it myself. I know that it is a lot of pressure on girls. I see the same thing with my daughters’ friends that dance. Glad both she and I never did either. I also liked that the Author addressed cutting. It isn't something very widely talked about and I wish it could get out more because I had a niece that had some issues with it. I think if people knew more about it maybe it could be helped or even stopped. All in all I loved this addition to snow valley! This novella was awesome! One of my good friends stutters like Annie. I am sure that she has had some rough times because of it. We have always had a great time together and it has never bothered me. Annie and Luke's story was so sweet. I like that he was patient from the start, he never saw her as anything but beautiful and perfect for him. It was fun to get a glimpse of Kazlyn and Ty again! Another great book by my favorite Author! Love all of Cami's books! This book was so sweet about past loves reuniting. At one point it almost had me crying. I love to see deserving people get their happily ever after and that is how this story goes. Loved it! Another great novella. Just when Becca thought her life wasn't going anywhere and she had no inspiration for the novel she wants to write everything in her life changes. I feel it was a great book for self discovery and happiness! The Count of Monte Cristo is my favorite of the classic books! I loved the references to it! Chet and Mercedes had such a great story. Their playfulness and instant bond and understanding of each other reminded me of my husband and I. It was an excellent finish to a great set of novellas! Originally I was going to write a little review on each book but each book is just amazing. Whether it is the fun story of Jace and Caytie where we see Jace find his love and have to break his views of who he wants and Caytie has to open up to the idea of marriage being something that isn't bad and how they lighten up around each other. Or Cameron and Kyle who show us that sometimes it is good to take a chance. kyle who loves his sister and takes a chance that Cameron will help her. Cameron who Originally I was going to write a little review on each book but each book is just amazing. Whether it is the fun story of Jace and Caytie where we see Jace find his love and have to break his views of who he wants and Caytie has to open up to the idea of marriage being something that isn't bad and how they lighten up around each other. Or Cameron and Kyle who show us that sometimes it is good to take a chance. kyle who loves his sister and takes a chance that Cameron will help her. Cameron who risks her job to help a girl who has a dream that isn't what she is doing and how trying to please her mom is hurting her. Those two are snarky and upbeat at the same time and show us that family and not forcing somenone else's dreams on others but to be who we are meant to be is more important. It also shows us that beauty is in the eye of the beholder and not what society dictates. Or Annie and Luke who show us that patience and kindness is rewarded with love and beauty. That our strength comes from within and that love makes us stronger. Or Janet seeing that forgiving and giving one another chance is worth it. that we cannot do things alone and one needs to let go of their fears and past hurts to truly see the beauty and what is in front of them. Or Becca who finds out that Nick is the special one for her and that sometimes it isn't the one who has the looks but the one who makes us special and has us feel safe and comfortable that is our partner. I read and reviewed Christmas in Snow Valley in November of last year and really enjoyed the town of Snow Valley and how they celebrated the Christmas Season. So I thought I would give this follow up Anthology, Summer in Snow Valley a go. This is a Christian romance, so there is absolutely nothing beyond some kisses in the book. So if you are looking for a romance that you can easily share with anyone, this would be a good fit. In the first anthology, most of the characters were in their 20's, wh I read and reviewed Christmas in Snow Valley in November of last year and really enjoyed the town of Snow Valley and how they celebrated the Christmas Season. So I thought I would give this follow up Anthology, Summer in Snow Valley a go. This is a Christian romance, so there is absolutely nothing beyond some kisses in the book. So if you are looking for a romance that you can easily share with anyone, this would be a good fit. In the first anthology, most of the characters were in their 20's, while this one seemed to have some older couples, there were still a couple that would be classified as New Adult. One of the things that I really liked about this was the continuity of characters. The town Doctor and Preacher that were found in the first anthology, once again make appearances through each of these stories as well. Additionally, a couple of the stories touched on related family members from their earlier stories. I like getting to touch base with characters and see how they are doing. There was only one story that I just couldn't connect with, and that was Romancing Rebecca. The female protagonist was just too immature in many ways for me to deal with her. To be honest, I skipped over about 2/3 of this story, read the the ending and moved on. The two middle books were the best ones, as far as I was concerned. Together as an anthology, this is a selection of six of the sweetest novellas I've had the pleasure to read in a very long time and had I realized what a treat it would be, I would have made sure these six authors were on the top of my TBR stack with every book they've written. What a breath of fresh air to find that there is still romance and sweetness t It is my pleasure to review Summer in Snow Valley and offer my review. I was provided a copy of this anthology in exchange for an honest review. I LOVE this collection! These books are written by some of the top clean romance authors out there, several of them are my personal favorites. This is the perfect collection to take on your vacation this summer! I love the way each of the books is written about the same little town of Snow Valley, Montana. I love the way that the town almost becomes a character and how several of the stories have cameo appearances by characters in the other books, so awesome! I've enjoyed all of the stories, but I LOVE this collection! These books are written by some of the top clean romance authors out there, several of them are my personal favorites. This is the perfect collection to take on your vacation this summer! I love the way each of the books is written about the same little town of Snow Valley, Montana. I love the way that the town almost becomes a character and how several of the stories have cameo appearances by characters in the other books, so awesome! I've enjoyed all of the stories, but I want to highlight just one... it's so hard to pick just which one! I'm going to go with Tin Foil Tiaras by Jeanette Lewis. I loved Cameron in this story. She wants to do a good job as a coach for the Snow Valley beauty pageant, but she also wants to be true to herself, her heart, and the young woman she's coaching, Annalisa. I loved the way she listened to her heart and to Annalisa's brother, Kyle instead of her demanding boss and Annalisa's pushy mother. The B&B is also really fun in this one, I was thrilled to see it make a return appearance in Romancing Rebecca. The ending of this one was such a cute surprise. 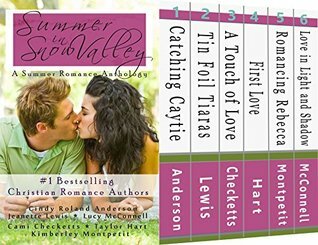 Summer in Snow Valley is an enjoyable Inspirational romance anthology collection that will tug at the heartstrings. Set in the small town of Snow Valley, Montana, the reader is easily swept away by these six lighthearted novellas that features hunky guys, sweet girls, and clean romance. I really enjoyed reading Christmas in Snow Valley, the first anthology collection, so I was pleased to see that Summer in Snow Valley brings the readers up-to-date on the characters featured in the first collectio Summer in Snow Valley is an enjoyable Inspirational romance anthology collection that will tug at the heartstrings. Set in the small town of Snow Valley, Montana, the reader is easily swept away by these six lighthearted novellas that features hunky guys, sweet girls, and clean romance. I really enjoyed reading Christmas in Snow Valley, the first anthology collection, so I was pleased to see that Summer in Snow Valley brings the readers up-to-date on the characters featured in the first collection, plus adding new characters and new romantic stories to enjoy. What I enjoyed most about this anthology collection is that these delightful stories flowed easily from one to another, the continuity kept me engaged and turning the pages. Summer in Snow Valley is the perfect romantic anthology collection that the reader can enjoy reading on a lazy summer day. Disclaimer: I received a copy of the boxed set from the authors / publisher in exchange for my honest review and participation in a virtual book tour hosted by I Am A Reader Book Blasts and Blog Tours. I read Christmas in Snow Valley when it came out and just loved the stories. I loved the location of Snow Valley and loved meeting all the characters who lived or visited there. When I heard a new boxed set, Summer in Snow Valley, was coming out, I just knew I had to read it so I could take a trip back to that great place. These stories all take place over the summer and focus on the events around the Fourth of July/Founders Day celebration. But the six stories, written by the six different auth I read Christmas in Snow Valley when it came out and just loved the stories. I loved the location of Snow Valley and loved meeting all the characters who lived or visited there. When I heard a new boxed set, Summer in Snow Valley, was coming out, I just knew I had to read it so I could take a trip back to that great place. These stories all take place over the summer and focus on the events around the Fourth of July/Founders Day celebration. But the six stories, written by the six different authors, each focus on different storylines, centered around seperate sets of characters. What I really loved about these stories is that they take place during the same time period, but we get to see what is happening through different sets of eyes. We get to see what everyone's lives were like as the events of that summer unfold.